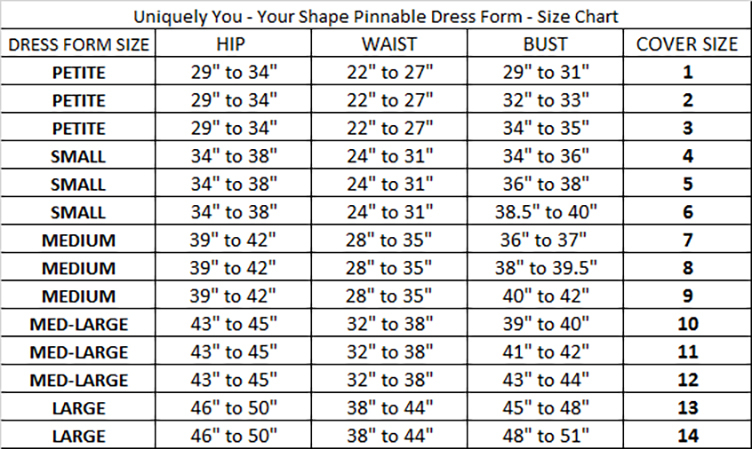 Uniquely You Your Shape Pinnable Dressform - Petite $199.95 - FREE SHIPPING! This item ships separately from other warehouses. Usually leaves the warehouse in 3 business days. Expedited shipping is not available. It is unique for a few reasons, the most obvious being that it is soft. It is made of high-density foam that allows you to pin into it easily, great for the sewer who uses the draping technique of pattern drafting. Being made of foam means it is ideal for use by corset makers as it can be squeezed and shaped much like the human body. Uniquely You Dressform includes a cover as well! Take the measurements over under garments at the fullest part of hip and bust to the closest half-inch. Select your form size according to hip measurement. 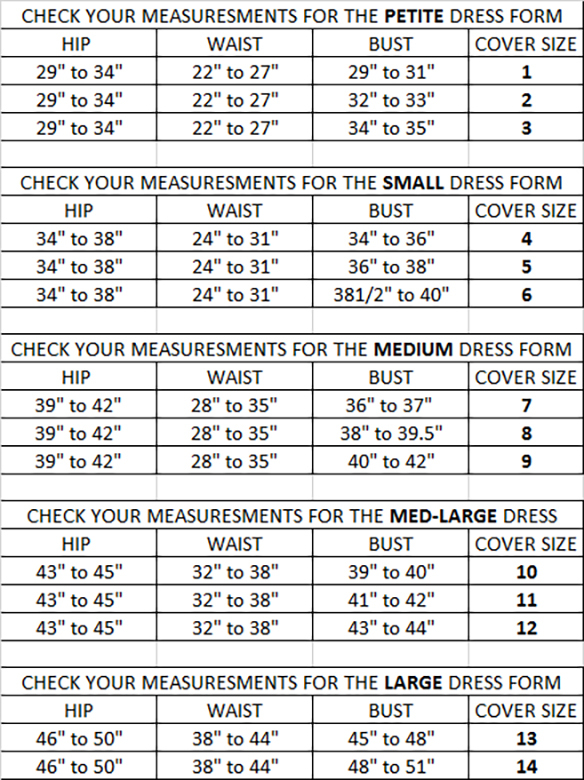 Then select your cover size according to your bust measurement. The chart applies even if you are short-waist (half-size) or long waist. Find your cover size across from your form size and select below. In really love my new dress form. Everything about her is fantastic I really love that you can pin all the way through her instead of sideways. The only critique I can offer is for two things. The pole that holds her up isn't long enough. The dressform really needs to be able to lift higher from the floor for hemming dresses and for easier fittings. The second is the weight. I really wish she was heavier or her stand was. This might help her not move around so much. When I got my form she was a bit dirty and had some hand prints on her. Her body also got a little snagged and torn from having the pole roll around in the box. I'm going to completely cover her up so it won't matter in the end but someone else might not love it. Over all I love that she can be sized down. Its so hard to find an affordable dress form that is customizable and small enough to fit me. This has to be the best form on the market -- I love it. Getting the cover on the form is a bit of a challenge: I found out that putting the form on the floor and kneeling on it with all my body weight made the process work fairly easily. This form is worth the effort! I've wanted a dress form for years, and this one was very reasonably priced, and delivery was satisfyingly prompt. Modifying the cover was challenging, but overall I'm very satisfied with the results. I think Zelda will make sewing for myself a lot more fun. I purchased 3 sizes of this form and 7 different sized covers so that I can fit almost all of my customers. I alter wedding dresses and formals for weddings and other special occasions. These work extremely well. I checked other kinds of dress forms and they were not as versatile. I also love that I can stick pins right into it to secure things while I work. I like that they are not very heavy, so I can move them around even with the gowns on them. I have not had a problem with the form falling over. But I put whole dresses on them, not pieces.